Frank Scoblete. He is a pro in whatever he starts talking about. He is completely wonderful in his descriptions and explanations. So it is time to talk about one of his really useful books called Break the One-Armed Bandits. He is telling about the mechanical evolution of the slots machines. Everything is so clear, especially when the author is telling the winning options on the old machines and how everything worked. What is good is that he interviewed influential people in the gambling world and gave the interviews on the paper. Certainly, he changed the names and so on and so forth but it is still so interesting to read. Scoblete even came to the casino and made his personal observations. He simply tells what he sees and he interviews the gamers and they are sharing their impressions of the game. The language is simple and easy to understand. You would not find specific terms that would lead you to the world of nonsense and you would not feel stupid or lost. His revealing character is so light for comprehension that after twenty pages of text, you feel like an expert in the slots field. It is a specific guide on the slots, where only they are described. If you are interested in which casinos you can play and what coupons you can get, you are free to read American Casino Guide by Steve Bourie. Scoblete is also talking about stretching. It is some kind of a strategy that is stretching your bankroll. Just like in any other game, if we take a negative-expectancy game like craps, or a positive-expectancy game like blackjack. Stretching in slots means finding the best slot machine for the money you have. It means it has to be a machine, which pays out the best return for your money and therefore you will play longer. 1. Find the casino that pays the best to the players. 2. You are to know the machines that return the best percentage in the casinos. 3. You are to develop some techniques that will help you to locate such machines in the casino. 4. You are to develop a strategy that will help you manage your bank roll for playing longer. 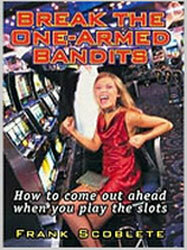 You can also compare this book to the Secrets of Winning Slots by Avery Cardoza and figure out which one you like more.